“Based on similarities in overall methylation patterns in replicative senescence and cancers, it is hypothesized that tumor-promoting DNA methylation in cancers derives from cells escaping senescence. We show that the tumor-associated methylation changes evolve independently of senescence and are pro-survival events with functional implications contrasting that in senescence. 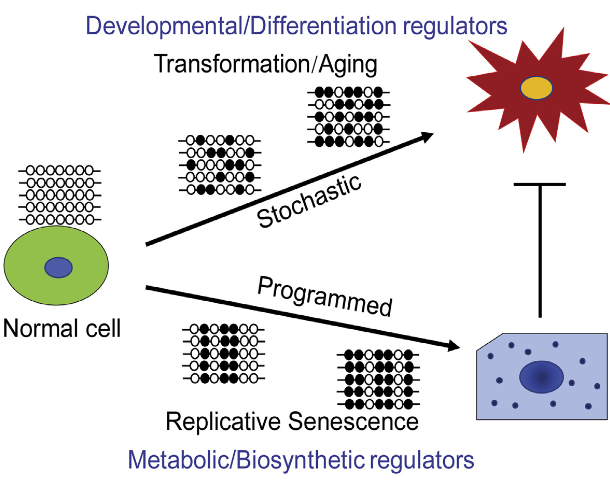 Would anyone at John Hopkins argue, as the graphic’s upper branch labeling suggested, that cellular aging is a predominantly random process?